Fans of the hit television show Lost know that the mystical island is really Oahu’s North Shore. And while Hawaii is certainly a beautiful place to visit, it’s not necessarily renowned for mystery. If you’re willing to forego tropical polar bears for giant tortoises and black rabbits, the “Others” for otherworldly legends, and television drama for up-close, real-time festivals and cultural encounters, check these islands that are full of unscripted intrigue. Teeming with local legends, unusual creatures, and mysterious tales, these islands are as close to Lost as one can get. Perhaps the most mysterious of all islands, Easter Island is famous for its moai, colossal sculptures (averaging 14 feet tall, weighing 14 tons) of the human form, each carved out of volcanic rock by the Rapa Nui people. The island, halfway between Chile and Tahiti, was designated a United Nations World Heritage Site in 1995, and travelers and archaeologists alike continue to be fascinated by its mysterious statues. Why did the Rapa Nui make them? How many people were needed to transport the 800-plus giant statues around the island? Who and what do they symbolize? While many theories have been presented on the moai—they’re representations of powerful chiefs or individuals, were placed by UFOs, are part of Atlantis, etc.—and the Rapa Nui themselves, their true origins and meaning are still unknown. 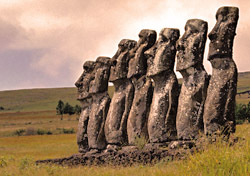 To get to Easter Island, LAN Chile Airlines flies in from Santiago or Papeete. You can then see the moai up close by taking an archaeology tour. The Tourism Promotion Corporation of Chile recommends several providers on its website. The Cook Islands, situated between French Polynesia and Tonga, consist of 15 islands in the South Pacific. Known for beautiful beaches, friendly locals, and outdoor recreation, the Cook Islands are also chock-full of legends. The locals can tell you stories about Maungapu mountain; how the sun was captured; and the infamous Ina and the shark, which describes how Ina’s quest for an ocean god determined why sharks and certain fish have specific characteristics. You may also hear tales of colonial clashes between indigenous islanders and missionaries, the voyage of the Endeavour and Captain James Cook, and cannibalism. Venture off Rarotonga and Aitutaki, the most heavily visited islands, for even more folklore on Atiu, Mangaia, or Mauke. Here you can tour burial caves that withstood battles and housed cannibal feasts, and hear stories about those laid to rest in the caves. Be careful not to get lost in the long passageways, underground among the bones. In the Indian Ocean, off the eastern coast of Africa, lies Seychelles, a chain of 115 islands known for spectacular wildlife. With half of the region preserved as national parks, Seychelles is an ideal home for coco-de-mer, or “coconut of the sea,” a colossal plant that has the world’s largest seed and leaf. Early explorers, baffled by the plant and intrigued by its unusual female-like shape, were convinced it was the plant that caused Adam’s fall, and believed the island was the location of the Garden of Eden. Beyond coco-de-mer, Seychelles also has jellyfish trees, featuring multi-stamen flowers, fissured bark, and dense foliage, thought to be extinct until the 1970s; and exotic species including the world’s smallest frog and heaviest land tortoise. UNESCO declared two areas on the islands as World Heritage sites: the Aldabra Atoll, four coral islands that are home to 600-pound tortoises and Valleé de Mai Nature Reserve, where one can find coco-de-mer trees. Seychelles residents descend from African, European, Chinese, and Indian explorers, and their culture reflects diverse folklore and oral traditions. Ghost stories, tales of buried treasure, and fables can be heard at the yearly Seychelles Creole Festival. In Scotland’s cold sea waters lie several islands with castles, stone circles, ruins, and plenty of folklore. On the Isle of Arran, located off Scotland’s southwest coast, travelers can visit Machrie Moor, which boasts several stone circles and some free-standing 18-foot-tall stones. Adding to the island’s romance and mystery are the 16th-century Brodick Castle, which still houses furnishings and art from its many inhabitants; the ruins of Lochranza Castle; and Culzean Castle & Country Park, which features an armory, ruins, and extensive grounds. The Orkney Islands, off Scotland’s northern coast, are well-known for their rich oral history and legends. On a visit here, you may learn of the White Nun who haunts Saint Magnus Cathedral, appearing only to those who circle the structure three times at night; of sailors lost at sea, stolen by a lovelorn mermaid in search of a husband; and of the island’s standing stones, sleeping giants in disguise that wake on New Year’s Day for a drink of water. Steeped in tradition from Norse settlers, the Orkney islands were once considered the home of fairies, witches, and ghosts. Today, visitors can tour the islands’ craggy shores, see standing stones up close, and marvel at ancient burial mounds. Located south of Japan in the Ryukyu Archipelago, the Amami Island is a little-known oasis inhabited by exotic wildlife. During a visit here, while exploring the island’s extensive mangrove forests, travelers may come across the amamino-kurousagi, a rare species of black rabbit, and the ruri-kakesu, a jay bird with bright blue wings. Both creatures can only be found on this island. Off the shore, Amami has clear blue seas with extensive coral reefs ideal for diving, snorkeling, or viewing through a glass-bottom boat. Visitors in autumn to Amami Island or spring to Yoron Island (further down the island chain) can witness the Harvest Dance Festival, where locals dance in request for good luck, a bountiful harvest, and plentiful rain. To take your Lost obsession beyond your couch, consider a trip to a mysterious island. Whether you want to see unusual critters, spellbinding local customs, or unexplained phenomena, these islands pick up where Lost leaves off, and can provide real-life adventures and intrigue.